What you're looking at here are two large gorgeous loaves of the Jewish traditional challah bread. I can't really give you much history on the having of challah for the Jewish holiday, but I can tell you that challah is an amazing loaf of bread that just makes you so proud for knowing just how to make your own homemade bread. Isn't that wonderful? Haha. I've always wondered how the challah bread they sell in many bakeries turn out so soft and well braided. 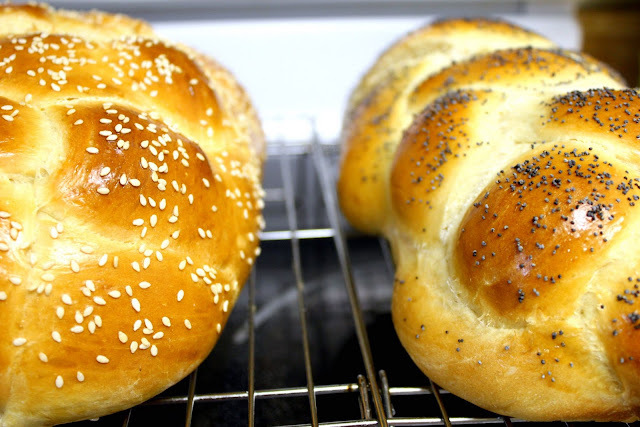 So then I came upon a series of videos on ehow that showed you step by step how to make Challah. So below, I posted the simple recipe in word form on how to make a traditional Challah Bread. I would defiantly suggest for this to be put up on the wall with all the other foolproof recipes, if only I've made it more times. Nevertheless, this is a sure winner recipe that you'll want to keep! recipe from a video series on expertvillage. Golden raisins as filling for a 1-strand swirl. Warm the water to 110F, or put your finger in it and should be warm but not hot. Pour in ½ cup of warm water in a shallow bowl, then sprinkle in the yeast over. Stir a bit and let it sit for about 5 minutes until it creates a nice foam. Scrap the yeast mixture into the bowl of a stand mixer, then add in the rest of the warm water. Use the same cup to measure and pour in the ¼ cup of oil and ½ cup of honey. Again use the same measuring cup to crack in the eggs, then pour the eggs into the mixer. Add in the 1 tbsp. of salt. Now, use a paddle attachment to beat the mixture until smooth. Add in 3 cups of flour and beat until smooth. Then continue adding more and more flour until the dough gets a bit too stiff, and then switch over to the dough hook. Then keep adding more flour until it forms a nice firm dough, taking about 10 minutes of kneading. It should cleaning the sides of the bowl and not sticky to the touch. Drop a little oil in the mixing bowl and place the dough back in. Turn over to coat the dough with oil to prevent drying out. Cover the dough with cling wrap, then cover that with a dry towel. Place the dough in a warm place to rise for 1 hour until doubled in size. Roll each strand so its fat in the middle and skinny at the ends. When complete, always pinch together the skinny ends and tuck it under the loaf. 1-strand swirl: Being careful not to stretch the dough, swirl it around one end and pinch the other end to the bottom. 3-strand braid: One over the other. Like braiding hair. 4-strand braid: This is like weaving. Over one, under one, over one. Stop, adjust and repeat. 6-strand braid: Over two, under one, over two. Stop, adjust and repeat. Place on parchment lined baking pan and cover with plastic. Let it rise again for 30 minutes until doubled. In a bowl, beat one egg and use a silicone pastry brush and lightly brush a thin layer of egg wash over the loaves being careful not to deflate it. Then sprinkle on the poppy seeds or sesame seeds. Preheat the oven to 325F, then bake the loaves on the middle shelf for 30-40 minutes. To test for doneness, tap on the top of the loaves or turn them over and tap again until it sounds hollow. Transfer onto a cooling rack to completely cool. Slice after cooled. If not eating right away, wrap and freeze once it’s done cooling. Then take it out the day being eaten and heat it up in the oven again.